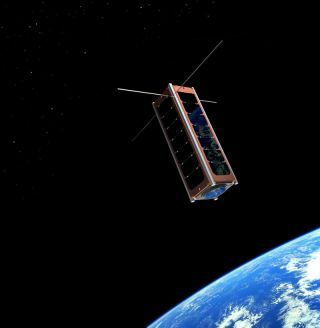 An artist's interpretation of a British Cubesat UKube 1. The UK SpaceAgency has announced it will develop and launch a miniature satellite to be usedfor inexpensive science missions in low-Earth orbit. Shaped likea cube and potentially smaller than a home computer, this type of satellite allowsscientists to research cutting-edge space technology quickly and at relatively lowcost, UK Space Agency chief executive David Williams said. The UK modelwill be one of a series of spacecraft called Cubesats, which are simple, tiny andinexpensive. These features make CubeSats capable of deploying on speedytimescales that accommodate numerous missions, agency officials said. "Britain?sfirst CubeSat will bring major benefits to the UK space industry," saidDavid Willetts, the UK's minister of state for universities and science. "Firmswill now have a cheap and quick way to test their latest prototypes." For the UK'smodel, named UKube 1, the agency will select the most innovative ideas for a payloadfrom a competition open to teams from academia and private industry. Thewinning proposal will launch in 2011 in a CubeSet designed and manufactured bythe Glasgow, Scotland-based company Clyde Space Ltd.
Eventually,the CubeSat will grant engineers an arena to test new technologies before spaceagencies incorporate them into risky missions.??? "Aswith all space related business, the best way to market space products isthrough their successful demonstration in orbit," said Clyde Space CEOCraig Clark. PreviousCubeSat missions include a NASA study that sent bacteria inside a miniature lab to investigate how spaceflightaffects the human body. The NASA Firefly project, another CubeSat venture, isexamining the relationship between lightning and gamma-ray radiation flashes inthe Earth's upper atmosphere. Particularlywell-suited to low orbit missions, the CubeSat has special potential forresearch into space weather, spacecraft damage, atmosphericscience, and high energy particle radiation, UK Space Agency officials said.And because satellites that orbit low revolve faster around the planet, thesemissions could be helpful for advanced disaster warnings for tsunamis, bush-firesand other emergencies, as well as to create real-time maps of the Earth. The UK'sSpace Agency also hopes the CubeSat mission can help inspire students. "[CubeSats]can easily be taken to schools and students can be engaged before and afterlaunch, including anything from mission ideas, hands on development, operationsand data analysis," said UK Space Agency head of education Jeremy Curtis. "They are a great way to attract and train a future generation ofengineers."